Together in the AllSeated community, we’ve pioneered a game-changing revolution in the event industry. The collaborative nature of AllSeated’s event layout software allows caterers, caterers, planners, vendors and hosts to work together virtually to create memorable events. There are many amazing features available to you when you use AllSeated’s event layout software for your events. Create and design amazing floorplans to-scale with AllSeated. Choose from a wide variety of table shapes, sizes and styles available in AllSeated’s furniture library to design a floorplan. Customize your floorplan while having the ability to adjust the spacing between tables as well as the number of chairs around each table. Use the various floorplan tools to perfect your layout and list notes within your floorplan diagram, if needed. It’s no surprise that most venues already have their floorplans uploaded to-scale within AllSeated as one in every ten events in America is created in AllSeated. If you cannot locate the floorplan for your venue within AllSeated, easily provide us with a floorplan marked with at least one accurate dimension and our team will scale and upload it into the platform for you. At any time, switch from 2D viewing to 3D viewing of your floorplan. AllSeated’s amazing 3D tools can also be set to “Bird’s Eye View” which allows you to see your floorplan layout from above. Alternatively, you can walk through the space in 3D as if you were actually moving through your event in 1st Person View. Taking a virtual walkthrough of your floorplan in 3D helps to ensure that you’re 100% satisfied with the layout before the actual event. AllSeated’s event layout software gives you an easy way to arrange your seating chart. The guest list will link directly to the seating section within your account which allows you access to easily seat guests at the tables that are positioned in the floorplan. As you arrange the seating, you will have options to seat guests at tables or seat guests at specific seats at each table. For example, you may wish to reserve specific seats for VIP’s, guest speakers or simply assign seats for specific tables (or even all guests) within your floorplan. Easily generate a variety useful reports for an event. Using the filters, easily select the types of reports you wish to create. For example, a floorplan report can be generated to detail your specific event layout along with complete listing of inventory, table breakdown and seating information. A guest report can also generated to include details such as meal types, table numbers and notes that relevant for the venue/caterer. Generate a separate guest list report to provide for invitations, place card creations and personalized event favors. Exhilarating developments are happening at AllSeated as we’re innovating faster and further than ever before with new features and tools for our user community! 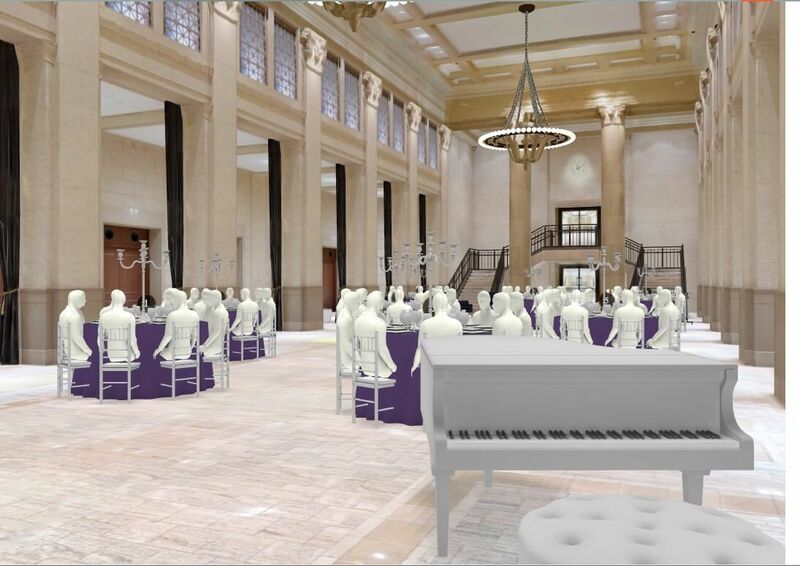 Use AllSeated’s amazing Virtual Reality tool to experience an event before it even happens! 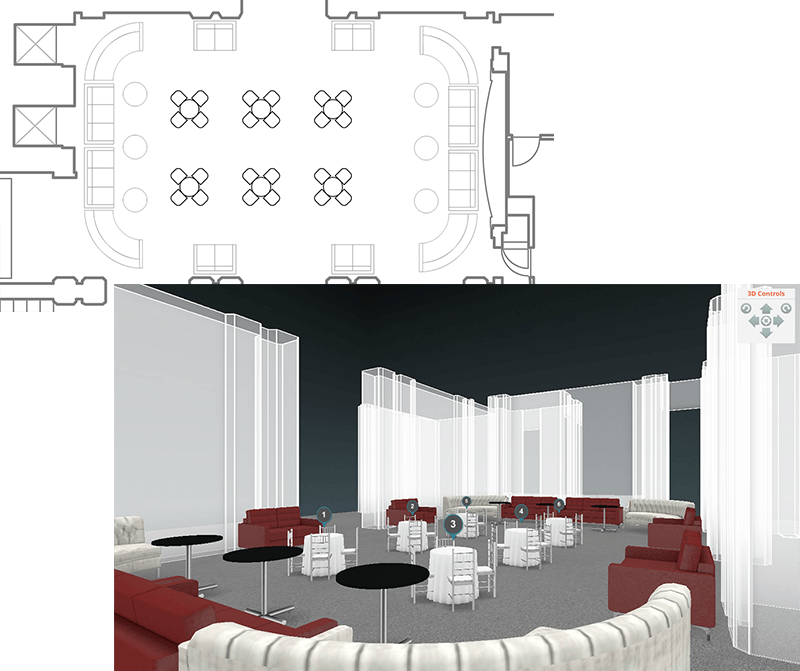 AllSeated’s special virtual reality goggles allow you to walk and tour an event layout in a realistic simulation. Learn more about AllSeated’s Virtual Reality and the three easy steps for getting started here. AllSeated’s event layout software provides designer tools to build to-scale tabletop and buffet displays within your floorplans.